Last 6th March, and that’s the 17th year, saw the celebration of the World Book Day. It is a worldwide celebration (designated by UNESCO) of books and reading marked in over 100 countries all over the world. UK and Ireland had launched a web page full of information and resources (they even have games!) about this day, aiming to “encourage children to explore the pleasures of books and reading by providing them with the opportunity to have a book of their own”. Last December, the Irish Minister for the Environment, Community and Local Government, Phil Hogan, launched the new strategy 2013-2017 for public libraries, an ambitious plan including for example a single national membership card, the creation of new services in the areas of business and information provision, etc. For this post we are reproducing the information from the Irish web page: Library.ie…”news from Irish libraries”. This year Trinity College Library Dublin will mark the tercentenary of the laying of the foundation stone of the Old Library, one of the great libraries of the Western world. The balance and symmetry of the architecture have made the building an icon for the organisation of human thought and expression. Its collections span over a millennium of recorded thought. To commemorate the occasion a one-day conference will be held entitled BUILDING COLLECTIONS: 300 years of the Old Library. 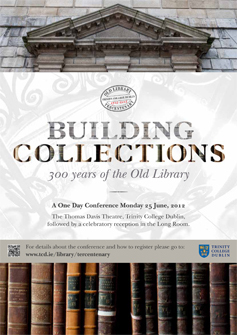 The conference will be held on Monday 25 June, 2012 in the Thomas Davis Theatre, Trinity College Dublin, followed by a celebratory reception in the Long Room. The conference will examine aspects of the physical structure of the Library, and its alterations through the centuries, as well as focusing on the context within which its renowned early printed books and manuscripts holdings have developed. The day promises to deliver fascinating insights into the progress of social and intellectual endeavour in Ireland, and the emergence of a world-class research library in Dublin. For further information visit http://www.tcd.ie/Library/tercentenary/. For this post we are collecting the information from the Irish web page: Library Services for Young People. Librarians from each local library service where a workshop is running are invited to participate in order to provide an additional opportunity for teachers to connect with their local service, learn about the services provided to schools and to develop links and further contacts to provide additional services for schools. Source of this information: http://www.library.ie/youngpeople/. We want to introduce the Blog http://www.library.ie about news from Irish Libraries. The blog is divided in different sections: contact, jobs and careers, libraries, book clubs, calendar and link.